Stir together flour and salt in a medium bowl. Make a well in center of dry ingredients, and add 1/2 cup water and egg. Stir with a wooden spoon until a shaggy dough forms. Turn dough out onto a lightly floured surface, and knead until smooth and elastic, 4 to 5 minutes. Place dough in a lightly oiled bowl, and cover loosely with plastic wrap. Set aside. Using a fork or your hands, stir together all meat filling ingredients in a large bowl until ground meat is completely broken up and mixture is well blended. Divide dough into thirds. Shape 1 dough portion into a ball, and roll out to about 1/4-inch thickness on a lightly floured work surface. (Keep the remaining dough portions covered with plastic wrap while you work.) Using a 2 1/2-inch round cutter, cut out 8 dough circles, rerolling dough scraps as necessary. Roll each dough circle into a larger 4-inch circle. Place about 1 tablespoon (about 1/2 ounce) meat filling in center of each dough circle, and pleat dough edge, gathering top like a pouch to enclose filling. 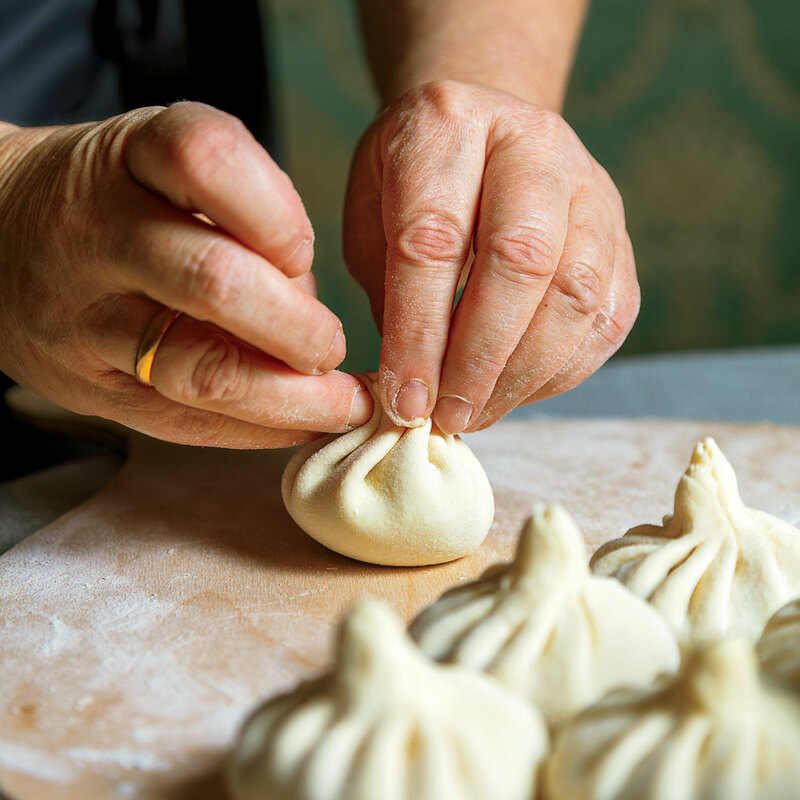 When you have pleated all the way around, pinch top edges together firmly, and give the dough a little twist to make a stem and to make sure the khinkali is well sealed. (If you don’t want the stems, lightly press the twisted stem down into the dumpling with your finger.) Place finished dumplings on a piece of lightly floured parchment paper; cover loosely with plastic wrap, and repeat process with remaining dough portions and filling. Bring a large pot of salted water and bay leaves to a boil over high. Carefully add half of dumplings to water, and stir gently with a wooden spoon (without piercing dumplings) to make sure they don’t stick to bottom of pot. Boil until dough is tender and meat is cooked through, 8 to 10 minutes. Remove khinkali with a spider, and drain on paper towels. Repeat with remaining half of dumplings. Sprinkle khinkali with black pepper, and serve hot. Khinkali are designed to be eaten by hand. Hold each dumpling by its stem (like an open umbrella) and take a small bite from the side of the cushiony top, sucking out the hot broth before digging into the filling. Discard the stem.